The Acadiana Advocate is expanding. Two veteran media executives with deep ties to Lafayette will be joining The Acadiana Advocate, and the news organization has doubled the size of its newsroom by hiring five journalists from The Daily Advertiser, Advocate owner John Georges announced Monday. Kevin Hall will join the news organization as chief revenue officer for Baton Rouge and Acadiana and Kristin Askelson will be the managing editor for Acadiana. Kevin Foote will join The Advocate as Acadiana sports editor, and the Louisiana-owned media company also hired reporters Claire Taylor and Megan Wyatt and sports writer James Bewers. The newspaper also named Shari Puterman as branded content editor. The Advocate expansion comes as the owner of The Advertiser, Virginia-based Gannett Co., is trimming staff and reducing the page counts of its newspapers. The Advertiser’s well-regarded editor, James Flachsenhaar, departed Friday, and the newsroom was turned over to an editor who will be based in Alabama. The Advocate continues to circulate a daily printed newspaper with separate news, local, lifestyle and sports sections at a time other publications have shrunk down to two sections. Georges said The Acadiana Advocate is proud to hire familiar faces who are well-known voices in news, sports and lifestyle coverage in the Lafayette area. “Our family has been servicing customers in Acadiana and south Louisiana for over 100 years,” he added. Georges and his wife Dathel purchased The Advocate in 2013 and quickly grew it to become Louisiana’s largest newspaper. Under their ownership, digital traffic has grown three-fold at a time when other news organizations have plateaued. Hall and Askelson become the second and third media executives from the Acadiana market to join The Advocate. Last year, Judi Terzotis signed on as president of The Advocate after four years in Lafayette. “I can’t think of two better people to lead the growth in Acadiana. Both Kevin and Kristin are invested in the community and the best in the business. Lafayette and the Acadiana region is a very special place. Its residents and businesses deserve robust platforms to tell their stories,” Terzotis said. Hall worked for Gannett in Lafayette from 2015 to 2018 and in Shreveport for three years prior. He comes to The Advocate from Central Control, a Pineville health care company. He has spent 25 years in advertising sales. "I am thrilled to join the team at The Advocate and Georges Media. The Advocate's commitment to local, Louisiana content, local business solutions, and local customer service demonstrates why the company continues to grow in audience in markets across south Louisiana,” he said. “All companies, regardless of industry, must deliver a return on their investment when they spend marketing dollars, and I will lead our sales and service teams to deliver results for those companies that choose to do business with us." Askelson has been a senior news executive at The Advertiser since 2010 and previously worked as an editor in Fayetteville, North Carolina. At the Advertiser, she spearheaded popular community initiatives like a campaign to help teachers pay for classroom supplies and oversaw news coverage of lax enforcement of DWI laws in Lafayette Parish. "My passion is local journalism — holding accountable those to whom we give our trust and our tax dollars, keeping people safe and informed and telling the community's stories. I'm excited The Advocate believes in these things, too, and is committed to ensuring Acadiana continues to have a strong local newspaper," she said. 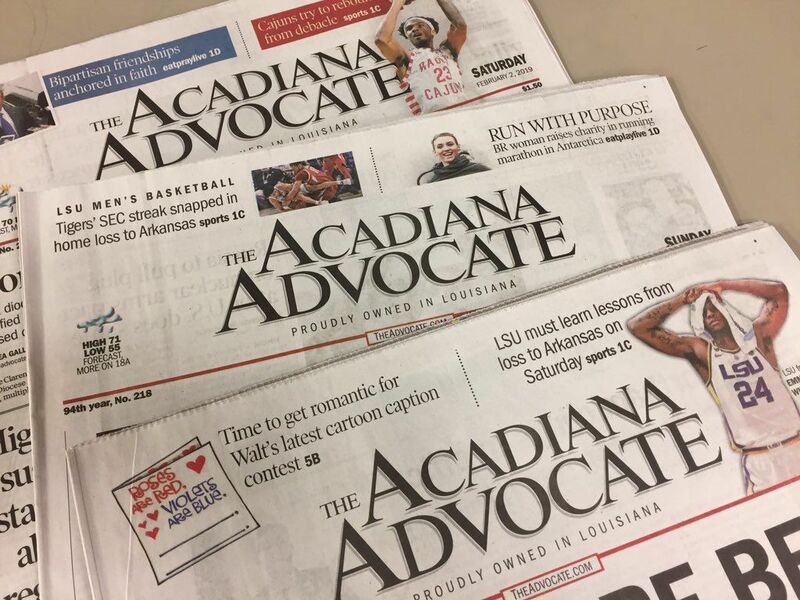 The Advocate has been circulating in Acadiana for years and has an office on Johnston Street, but the expansion announced Monday is the newspaper’s most aggressive push. Foote, the new sports editor, was born and raised in Lafayette and has been covering sports in Acadiana since 1983. He’s won numerous awards over the years, including Louisiana Sports Writer of the Year in 2014. “I love sports and history and connecting the dots on what we’re watching,” he said. He’s written about concussions (including his daughter’s), cheating and the lives of athletes that were tragically cut short. Recently, he delved into hard news reporting, resulting in the reopening of an investigation of the slaying of his father, Russell Foote, the well-known director of the Red Cross in Lafayette. Taylor, an award-winning investigative journalist, has deep roots in Acadiana. “From the prairies of Acadia Parish to the swamps of the Atchafalaya Basin to the salty air of Grand Isle, my people have been here since the 1700s,” she said. Taylor has spent the past 19 years covering Acadiana, from city and parish government to business development to priest abuse scandals. Her reporting into the handling of DWI arrests in Lafayette resulted in policy changes in the Lafayette district attorney’s office and her coverage of a local community action agency led to a federal review of its Head Start program. For the past eight years, Wyatt has been writing about Acadiana’s culinary scene. She has also covered the University of Louisiana at Lafayette and has been a general assignment reporter. Wyatt’s passion for crunching numbers and holding the powerful accountable has led to national, regional and statewide awards for outstanding writing, investigative reporting and watchdog reporting. Her story on Louisiana’s restaurant inspection process prompted the state to launch an internal investigation into how the system fails consumers and protects business owners. Bewers is a New Orleans native and a graduate of LSU, where he earned a degree from the Manship School of Mass Communication, with a concentration in print journalism. Bewers joined the student newspaper during his junior year at LSU and was a freelance writer for The Advocate in Baton Rouge. He has covered high school sports in Acadiana since 2017. Puterman joins the Advocate after 11 years with the USA Today Network. Puterman most recently served as features content strategist for Louisiana after relocating from New Jersey, where she held a similar position. Upon moving to Lafayette in 2015, Puterman launched various lifestyle sections that ranked among the state's top-performing content in audience engagement and advertiser appeal. In her role as branded content editor, Puterman will work closely with the news and sales teams developing content that connects advertisers with audiences in innovative ways. Personal injury law firm Laborde Earles will move into a new 20,000-square-foot office on Kaliste Saloom next to Parc Lafayette in April. UL junior Justin Miller, who had a game-high 13 rebounds in Friday's 76-72 win over Georgia State, said the team won the game for coach Bob Marlin and his coaching staff.